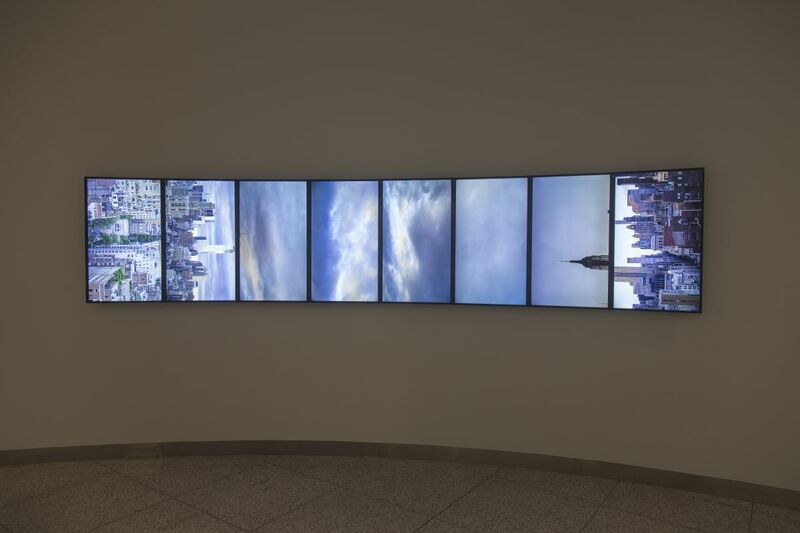 The Long Division, a multi-channel video installation, reconsiders the New York skyline by producing a 180 degree live view of the sky above 55 5th Avenue. 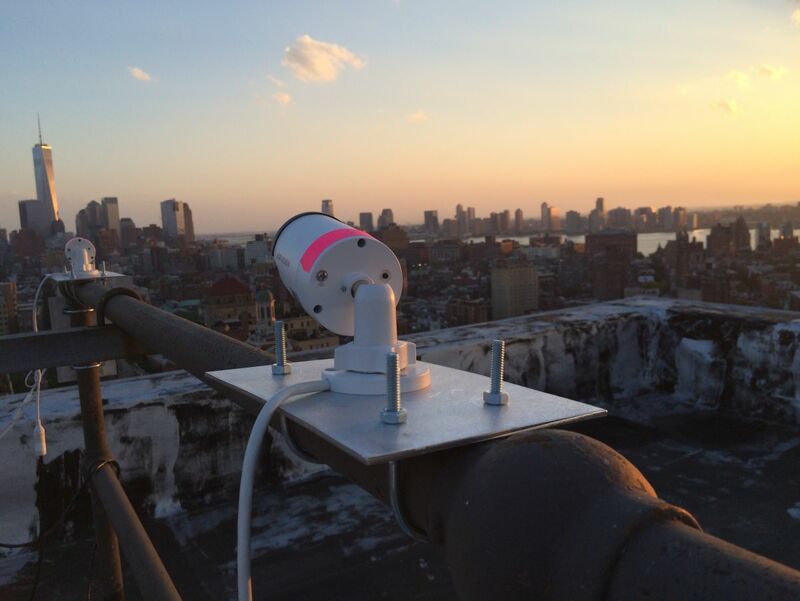 Eight CCTV cameras mounted on the roof look outward to trace a line between the Freedom Tower and Empire State Building. 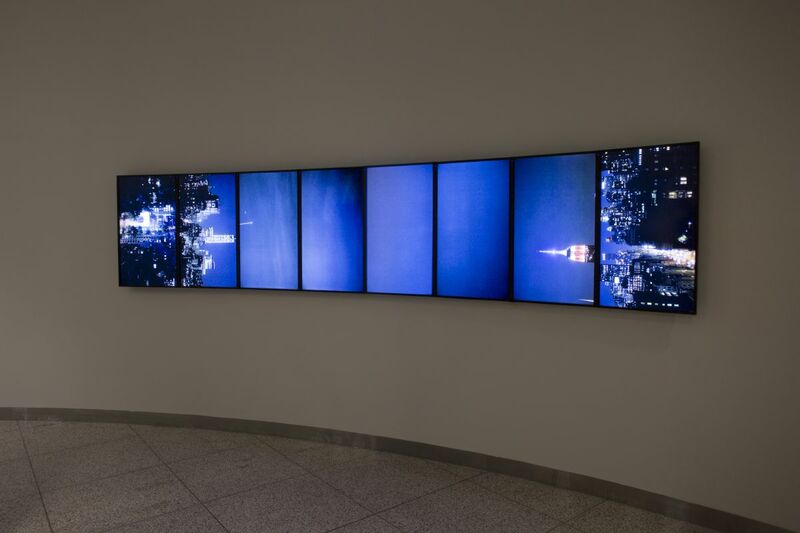 Eight monitors in the lobby receive a distinct channel of the larger interconnected sweeping view. Simultaneously looking both north and south, The Long Division reorients the viewer within Manhattan and creates a new, yet impossible, view of this well-known path. 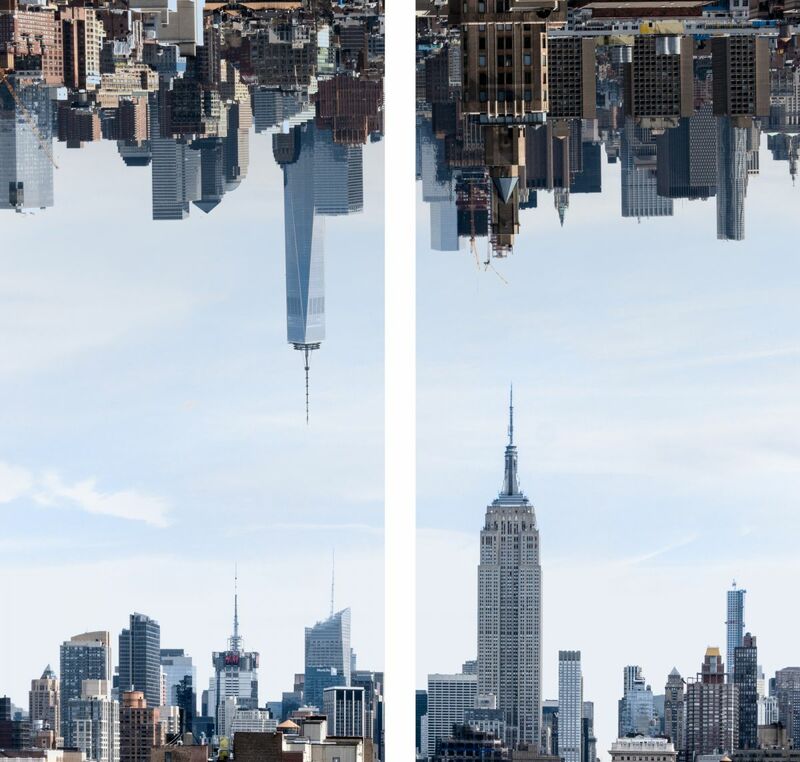 The absurdity of the technical and physical feats needed to accomplish this installation is not lost on the artists; a viewer could simply step outside the lobby to see nearly the same skyline. 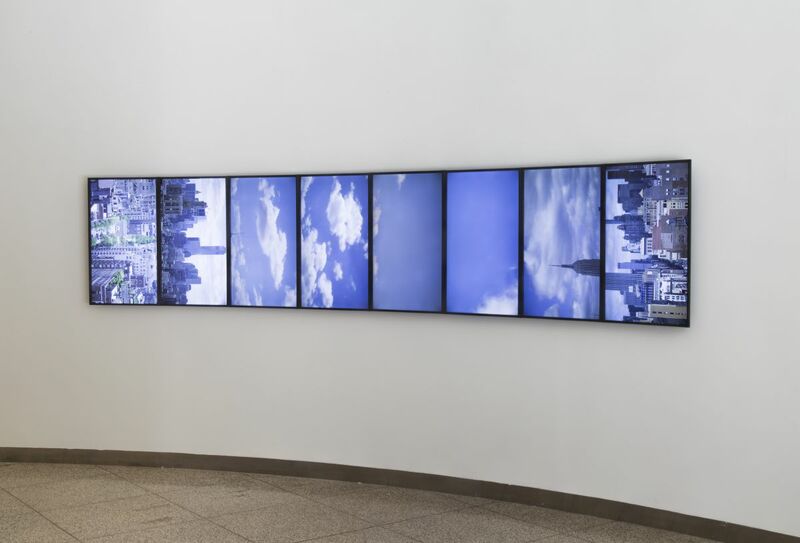 However, the lens of each camera frames the sky, allowing the artists to tune into a specific view. It removes the clamor of New York City from the equation and creates a situation in which one can concentrate on a single thing, a rare moment in New York. However, this rare, focused moment comes per the mediation of a screen. The feed is live but will not be recorded, rendering each moment on screen as ephemeral and fleeting as those in the sky. The Long Division takes its title from the standard method for dividing multi-digit numbers by hand. It also references the North-South and East-West divisions of New York. Both the mathematical exercise and the urban mapping allows for an easier, more basic understanding of a larger sum or space. The Long Division continues Cooley and Lewis' collaboration In the Valley of the Sun, presented at Sonoma State University in California. 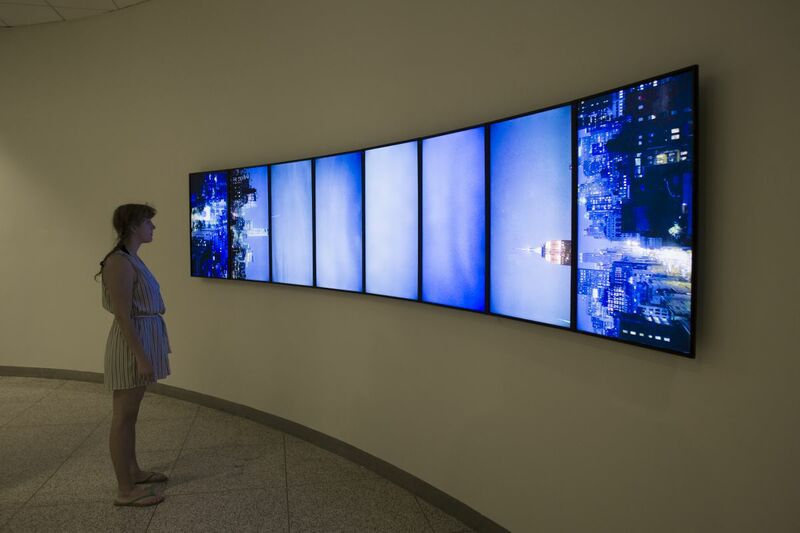 In the Valley of the Sun used CCTV cameras and flat screen TVs in the shape of an arch to create a simulation of daylight by tracing a 180 live view of the sky from sunrise to sunset. 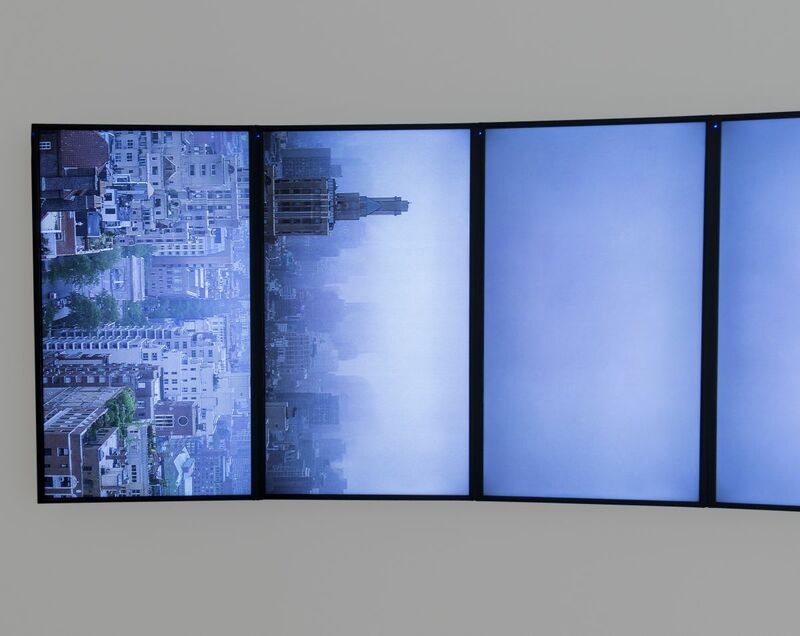 The Long Division is the sixth solo exhibition by Kevin Cooley and Phillip Andrew Lewis and their first in Manhattan. The two artists met and began collaborating together while Artists-in-Residence at the Bemis Center for Contemporary Art (Omaha, NE). Their first collaborative commission, Through the Skies for You, won the 3-D Award at ArtPrize 2013 (Grand Rapids). Their work has been shown at Kopeikin Gallery (Los Angeles), Zeitgeist Gallery (Nashville), Pierogi Gallery (Brooklyn), Kendall College of Art and Design (Grand Rapids), and Sonoma State University (Rohnert Park). Last year, they released a limited edition unique phonograph and print box set as part of their project Harmony of the Spheres. In the foreword of their recently published catalogue—A Short Period of Intense Collaboration—critic Michael Wilson describes their practice, stating "shared fascination with such natural occurrences and their sometimes-unexpected intersections with human culture have already made their collaboration extraordinarily fruitful, but far from being a fait accompli, it is still evolving, its fusion of the observed and the imagined resulting in a living methodology and a set of works that are genuinely—and thrillingly—experimental." The Long Division also exists on the Internet. Visit the project's website, www.thelongdivision.net, to view the live feed. The Long Division is curated by Jennie Lamensdorf and sponsored by the Time Equities Inc. (TEI) Art-in-Buildings. TEI is committed to enriching the experience of our properties through the Art-in-Buildings Program, an innovative approach that brings contemporary art by emerging and mid-career artists to non-traditional exhibition spaces in the interest of promoting artists, expanding the audience for art, and creating a more interesting environment for our building occupants, residents, and their guests. Read our interview with Kevin Cooley and Phillip Andrew Lewis on the Art-in-Buildings blog.